It is said that the Filipino people are known for their hospitality. When compared to the western world, there is no comparison. However when we talk about hospitality within the confluence of the South East Asian region, hospitality is an inherent part of the culture of the people of Asian. I had been fortunate enough to travel to most parts of Asia and with that the good fortune to experience not only the hospitality of the Filipinos but also that of the Thaïs, Indonesians, the Laotians, Singaporean and the Malaysians. If you ever drop by the home of any of these cultures, your host will definitely offer you something to drink or eat. All these cultures practice the same values, like close family ties, respect for the elder and loyalty among their countrymen. Perhaps, it is due to the former colonial Americans that gave the impression that Filipinos are exceedingly hospitable people. Interestingly, the Filipinos do have their own unique traits like any other race. Singaporeans for example are known as “Kiasu” (Scared to lose type). Malaysians, “Malaysia Boleh” (loosely translated, Malaysia everything can). For the Filipinos, they themselves are said to be ‘Balimbing” (double faced) when it comes to political situations. This does not refer to just mainstream politics but also to everyday household politics. A lot of the traditional values of the Filipino people have actually been eroded due to the economic circumstances over time. With a population of around 90 million people, jobs are scarce and up to 50% of the population lives below the poverty line. In response to this, the Philippines have became the biggest exporter of manpower in the world. Each year, around eight million Filipinos (Overseas Filipino Workers - OFW) had to work overseas and sent money back home to their families in order for them to survive. It is this economic and sociological phenomenon that actually produces the uniqueness of the Filipino culture today. Not all this has resulted in negativity. In fact, the Filipino traits that emerge from this social impetus are rather more comical to the uninitiated rather than a turn off. For example, due to the traditional close family ties, it is considered improper for a returning OFW to return home empty handed without any “Pasalubong” (greeting gift). 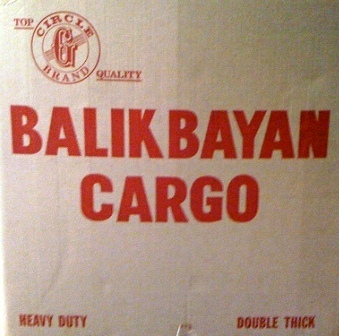 Thus, you will know your fellow traveler is a returning OFW if his or her other piece of baggage is the “Balikbayan box”. With the need to conserve economically, frugality takes on an entirely new perspective. For most of us, Xmas time is a time of joyful spending and celebration. Yet as a visitor to this beautiful country, don’t be surprise if the recipient of your gift will carefully unwrap his or her present with the intention of saving the wrapping paper for next year Xmas! Another peculiarity about the Filipinos is their love for acronyms or nicknames. Thus, you will get to hear phrases like “D.O.M” which stands for “Dirty Old Man” or “OA” which means “Over Acting”. And they love to use nicknames! The one thing good about this is that you know they are ANGRY when they start to call you by your REAL name! Above all else the Filipinos are a very proud race. They do not take criticism easily even if you have acted without any malice. Jokes can easily be taken the wrong way and that is a sure recipe for antagonism. The best course of action to take when visiting this country is just to mind your own business and go about enjoying what this beautiful country has to offer. At times, this might be difficult especially on a society that thrives on story telling, mind you not all Filipinos are like this. There is a big disparity in terms of culture and attitude between the “have not’s” and those who are well off. Then again with half the population living below the poverty line and a substantial percentage marginally above it, the odds of you bumping into a middle class individual is 3 out of 10. Have you noticed a particular Filipino trait that is unique to the Philippines? What was your experience like? Share your Filipino trait! * Did the trait make you laugh? * Did the trait make you cry? * How was it unique to the Philippines? Help others understand Filipino traits, share your experience about it! What was the Filipino trait you observed?